It's that time of the year for graduations. 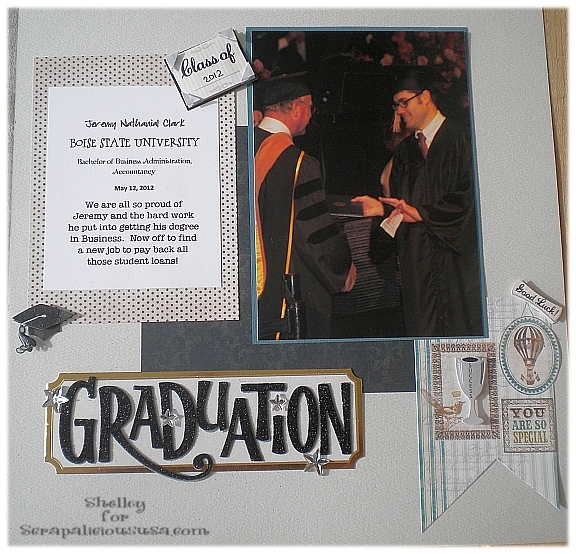 At Scrapalicious our challenge is to create something using a Graduation theme. As many may already know, my eldest son recently received his Bachelor in Business at Boise State University. I decided for my project I would create a page layout using some of the cool papers and stickers available over at Scrapalicious USA. I decided to keep it sort of clean and simple. It's easy to get a bit crazy when you have all the cool stickers and embellishments to play with, but since he is a guy, he certainly wouldn't appreciate glitter on his page! Great layout. My son graduates from high school this Saturday.